The 2012 vintage was a warm one, and a far cry from the two proceeding it, it was downright robust in terms of sunshine, heat units and nice dry weather that led to ripe fruit and rounder wines across the board. While the 2012 Pinot Noir from the Willamette Valley are just now beginning to see the light of day in terms of their release, we do have the white wines to draw conclusions from. With a warm vintage you typically see in general ripeness, higher sugars, lower acidity and this often results in higher alcohol levels in the finished wines. There are upsides to a warm harvest for growers and winemakers, as well as wine drinkers. Reliable ripeness, fewer issues in the vineyard, whether that's nasty wet weather, cold or as the season goes late, birds. 2010 was a cool vintage and as growers kept the fruit hanging to achieve ripeness there were many bird related grape casualties. It is an oversimplification to call any vintage, "easy" but relative to 10 and 11, 12 was, well, easy. Warm vintages are popular with the industry because while stressing the vines makes for wines of distinction, stressing the growers and winemakers can make them crazy. The downside to a warm vintage is that you can see flabby wines, round, ripe certainly but possibly lacking in the necessary acid that makes Oregon wines such standouts. David Lett, no surprise, was the first to plant Pinot Gris in Oregon and it is now the largest planted white variety in the state. This is due in no small part by the success that King Estate has found with the wine. 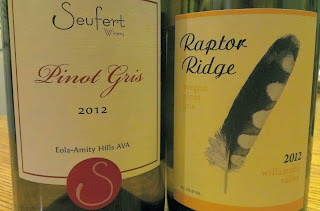 They are the world's single largest Pinot Gris producer, in... well, the world. 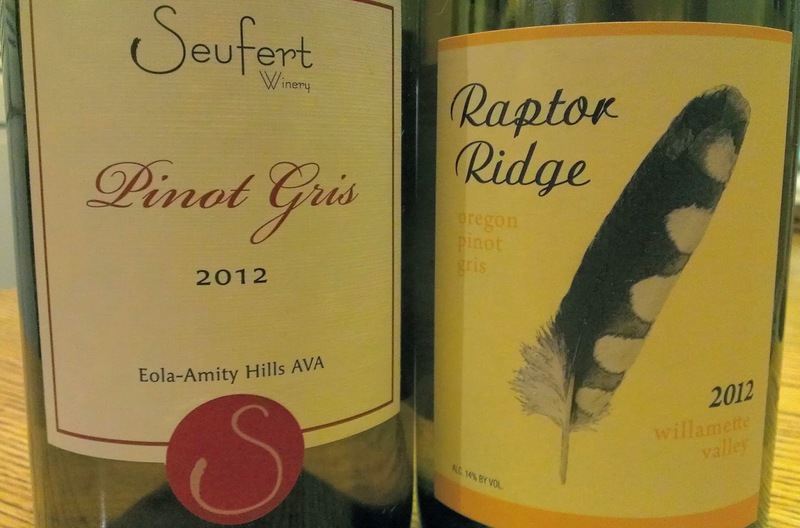 Oregon Pinot Gris has long stood in the shadows of Pinot Noir, but has largely developed a "style" all it's own. Known for being medium in body and a bit weightier than their California counterparts which are often found under the Italian "Grigio" pseudonym. Pinot Gris ripens early and so higher sugars can often point to a bit higher alcohol wines. Neither of these wines are flabby, or boring and both would make for a nice food pairing, The slightly lower acid levels open up possibilities from spicy dishes to grilled or baked fish dishes as well. As we wait for the 2012 Pinot Noir from the Willamette to start hitting the shelves we can find in these wines that the future looks good. Acid levels are sufficient and Pinot Gris as opposed to Pinot Noir would have been at greater risk for over ripening. In speaking with winemakers I know, folks are very happy with what 2012 has given them and excited about the wines to come. In addition we can only guess at what kind of vintage 2014 will be, it hasn't even technically begun. My biggest hope is that the brutal cold snap of this past week does not leave behind significant vine damage. These wines were provided by the wineries as samples. Listomania 2013: Top 100 Wine Extravaganza!